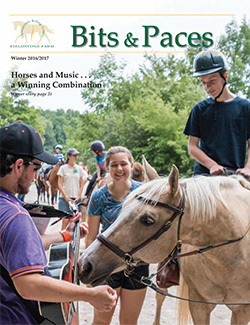 December 15, 2016 – Check out stories and pictures of our students, horses and volunteers in our winter newsletter, now online. You will be inspired by all that is achieved through the healing powers of our horses. Click here to go to our newsletter. A big thank you goes to all of our photographers for capturing the spirit and success that takes place at Fieldstone Farm throughout the year. Thank you Marty Culbertson, Frank Gwirtz, Lynne Netschke, Tammie Packer and Creed Woodka. ← Fieldstone receives four stars!